Vietnam is so appealing to many foreigners that they end up becoming long-term expats and consider it a second home. When he first came to Vietnam in 2006, Mr. John Smith, a student from UK, planned to stay about six months and travel around the country. That he would still be here more than a decade later never crossed his mind. With a good standard of living, career possibilities, and a family, Vietnam has become his second home and like many expats he can’t see a day when he would ever want to leave. With a history and culture spanning thousands of years, Vietnam is an appealing place for Westerners looking to discover the East or simply find something different. As the country has developed rapidly in recent years, Vietnam boasts a combination of the old and the new compared to China, Japan, South Korea, Singapore and Thailand, which have developed for a longer period, been industrialized, and more resemble Western countries, many expats agree. Some fell in love with Vietnam at first sight, as happened to Rodion Fedorov from Russia, who studied Vietnam at the University of Saint Petersburg. When he came here in 2008 he was impressed by its nice weather, beautiful landscapes, great food, warm smiles, and beautiful women. Similarly, Mr. Smith added that every corner in Vietnam can tell you something, such as old houses in Hanoi combining French architecture and Vietnamese living in the past, happy old people doing morning exercises in gardens and parks, and street food stalls open until midnight. “After 12 years in Vietnam, every day I still discover something new,” he said. Keen on living abroad to gain new experiences, they researched different countries before deciding on Vietnam and then moved their whole family to the country. The friendly, relaxing and positive spirit of Vietnamese people is another magnet encouraging expats to stay. Mr. Fedorov noticed soon after arriving that nearly every street is alive with people shopping or eating in a happy atmosphere. This positive energy changed him and made him happy and keen to stay long term. 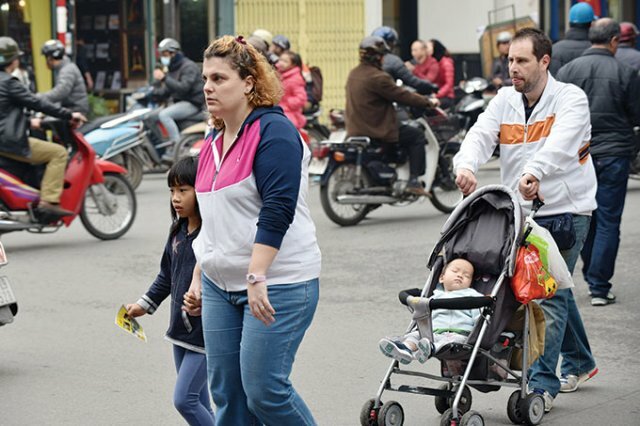 Vietnamese are friendlier than people in most other countries, expats find. Strangers smile at them on the street and involve them in toasts at “bia hoi” and beer clubs even though they don’t know any English. Local friends, meanwhile, invite them their home to eat, take care of them when they hang out together, and give them a hand when problems arise. Most expats find it easy to get a job and live well. Thanks to its economic growth and globalization efforts over recent years, Vietnam offers good job opportunities and different types of work. As teachers, Mr. Boulo in science and economics and Ms. Boulo in primary school, they secured jobs at the French International School before coming to Vietnam and their kids also have a good study environment as the school. Along with food and accommodation, many other things in Vietnam are cheap and convenient. Shops and food are open until 9 or 10pm everywhere and they can park their motorbike on the sidewalk and get what they need for a few dollars. In Europe, meanwhile, shops can close at 6pm or soon after and everything on the shelves is more expensive. Entertainment, such the cinema and art and music shows, as well as travel, which is important to many, are also much cheaper here. Most expats have seen more of Vietnam than they have of their home country. There are, of course, issues to be faced when living in a foreign country and this is true of Vietnam. Another difficulty for expats is complicated administration formalities such as work permits and working visas and the procedures for doing business or marrying a Vietnamese citizen. In many cases these things require an intermediary be engaged at a great cost, according to Mr. Fedorov. In addition, as Vietnam is developing quickly and life becomes busier, traffic jams, air pollution, and noise pollution can make some days quite stressful and force a re-think about staying into the future. Agreeing, Mr. Fedorov said that the influence of globalization and integration is unavoidable and helps with development, but Vietnam needs to retain the national character that many foreigners fall in love with.